The AKG DSE-7000 - "A Digital Workstation Just For Us!" At least a dozen times in the past year, it seems this RAP sheet has had to use, in one article or another, the phrase, "designed with the musician in mind." We have had to accept factory programs in our digital processors that bear names like "acoustic guitar reverb" or "thunder snare." 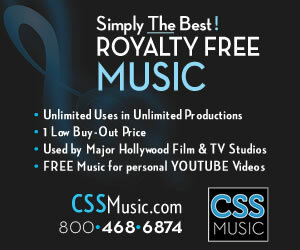 We have all seen ads and brochures or read articles about six-figure, RAM based digital workstations that are "perfect" for the large production house that makes its money churning out major productions for the film, television, or music industry, and, by the way, it'll work in broadcast situations, too. In the world of the big digital audio workstations, radio production types have humbly remained unnoticed, clinging to our trusty 4 and 8-track analog recorders while manufacturers continue to design their DAW's for the larger markets of the music, film, television, and recording industries. Well, things have changed, and our hats are off to AKG Acoustics for the most serious approach to digital audio workstations designed for radio, our industry has ever seen. AKG didn't contact major recording studios and ask the engineers what they thought would be a good machine to produce radio spots on. They didn't call up engineers at radio stations across the country and ask what they thought their Production Directors could use in their studios. Instead, AKG spoke directly to the people who spend their days cranking out spot after spot, promo after promo, sweeper after sweeper. They spoke to Production Directors, and they asked the right questions -- questions like, "What's most important to you, speed of production or the ability to reshape the ADSR envelope of a sound?" They asked, "Do you want a machine that will double for the cockpit of an F16 fighter jet, or do you want a machine that will put your old 8-track to shame and be half as easy to use and three times as fast?" They asked, "What do you want this digital workstation to be able to do?" They talked to the people the unit was to be designed for and managed to come closer than any other manufacturer to providing a DAW specifically for the small group of people that are radio's production rats. The machine is called the DSE-7000, and it belongs in every radio production room where speed, quality, and ease of use are top priorities. The DSE-7000 is RAM based. If a system isn't RAM based, it utilizes the hard disk recording technology we discussed last month. On the DSE-7000, all editing, recording, and playback functions are done in RAM. This aspect alone sets this machine well above the many hard disk systems on the market when it comes to speed, one thing most necessary in a radio production environment. However, as is the case with any RAM based system, this speed comes at a price, but we'll drop that bomb on you later. The DSE-7000 is very simple in design. The computer running the show is an Intel 80386 based IBM compatible. Like any personal computer system, you get a keyboard, a monitor, a hard disk drive, and a floppy disk drive. The keyboard is hidden under the control panel and is used primarily for naming productions or elements you wish to save. The internal hard disk drive is used only for backup and storage purposes. The floppy drive has several purposes we'll mention later. The monitor is your standard fourteen inch color monitor. Add a couple of DSP cards for proces-sing the audio and you have a PC ready to deal with digital audio. Next, and most impressive, is the software this computer runs. Consisting of a handful of DOS files residing on the hard drive, the program itself is the heart of the DSE-7000. This is a program written for 8-track radio production. It's straight forward and easier to learn than some video games. This facet of the program makes it very attractive to stations where more than one person will be using the machine. You don't need to be a computer wizard to use it. You don't need to be a MIDI magician to understand it. A basic understanding of multi-track production is all that is needed to be up and running on the machine in thirty minutes or less. 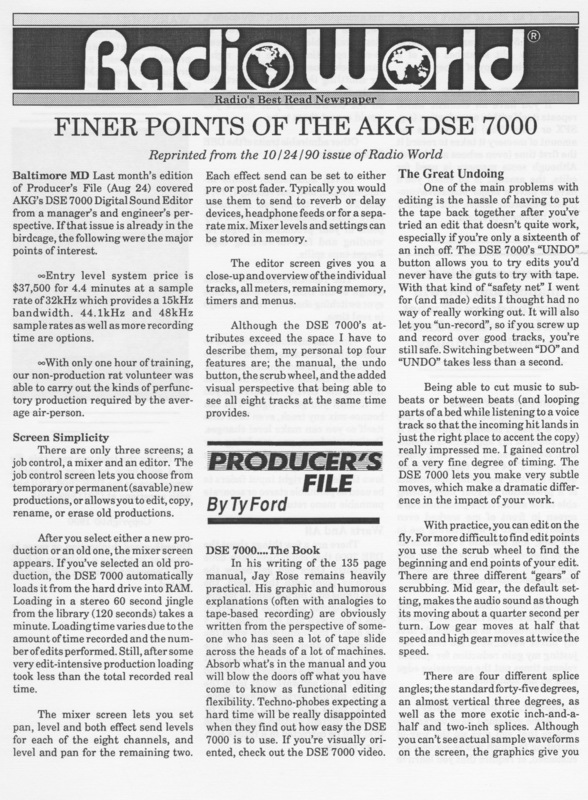 A jock who is familiar with blade editing and simple 4-track production will fall in love with the DSE-7000 before he or she has even read the manual. It was October of 1990. I'd been writing reviews for Radio World since 1987. AKG had a what? A workstation? Sure, send it. The first one arrived with a dead power supply in the PC tower. I soon met messrs. Pierce, Blesser and Steadman over the phone. The entire tower was replaced overnight. A long cable was needed so the tower could be shoved into a closet like a red-headed stepchild because it was noisy! I had been doing radio production for twenty years, primarily with mono and stereo reel to reel and cart machines. You know the drill; fingers, knees and elbows to hit the play buttons while you performed copy at the same time. Because Pierce, Blesser and Steadman had done their homework, it took moments for me to figure out how to use the DSE 7000. The scrub wheel let you rock the audio just like rocking analog tape reels; and dead nuts accurately. The DSE 7000 list price was $46,500 by then. Very expensive for radio broadcasting GMs to get their heads (much less budgets) around. After two months at my studio, I joined the team, bought one and never looked back. Somewhere in my memorabilia, I'm sure I have a paper copy of my review in Radio World. I was asked for a quote for AKG marketing. It ended up on the back of a DSE 7000 T-shirt that was given away at the next NAB Convention. I have one of those T-shirts in a cedar chest. I said something like, "To me it's another day in the studio. To my clients, it's a magic carpet ride." I remember being called in several times to local stations by AKG to do a demo on a loaner. WPGC AM/FM was one such occasion. They are in Washington DC. I knew their CE who also wrote for Radio World. I told him the DSE 7000 was a game changer. It took 3-4 days for me to arrange to meet with the Production Director at WPGC. By then, he had already figured most of it out and was stunned by its abilities. 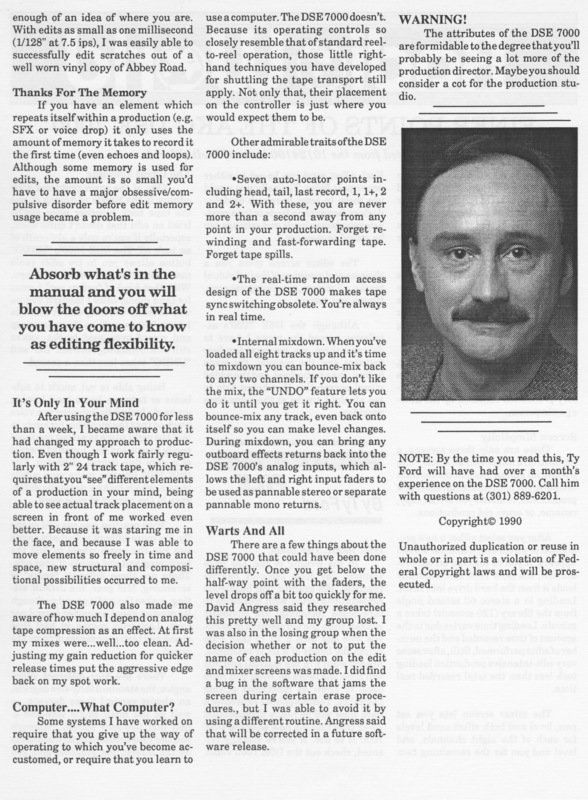 When I left radio in 1986, the DSE 7000 allowed me to attract clients because of the speed of the workflow and facility with which you could edit. I remember one session in which audio was brought in on reel to reel for me to edit and mix. I'm loading in the audio and part of me is freaking out because I hear this hissing noise. WTF is THAT!! Oh, its tape hiss. My God, I'd forgotten all about tape hiss by then. The DSE forced one other technical change. I had been using a Sennheiser 421. The CRT of the DSE 7000 blew a ring of EMI noise straight out like a smoke ring. The 421, being a dynamic mic with a coil attached to a diaphragm picked the noise up very well. 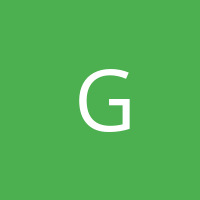 Gotham Audio had just lost the Neumann account, found Gefell in East Germany and began to import them into the USA. I replaced the 421 (still have a nice pair of them) with a Gefell M71 cardioid condenser mic and a Symetrix 528. I got the Mattress Discounters account and was producing a TV VO track and multiple radio spots with edits for Boston, NJ, Baltimore, Washington, Richmond and San Jose. Each spot had to be customized with a tag for each market. No problem. After I edited and mixed each version, I rolled the dubs off onto two Revox PR77 mk ii and FedExed a package of dubs to each market. At its peak, my Mattress Discounters account was worth $30,000 a year. Hammerjacks, a major local R&R bar and concert venue was in every week to do at least two concert spots, each with 5-6 upcuts. We needed to time compress the voice guy because they always had too much copy. By then I also had (and still have) an Eventide H3000 with full sampler card. I'd record his voice to the DSE 7000, edit out the breaths and send it to the H3000 sampler card where we could typically get 10-13% compression before things started to sound wonky. Then I'd dump that back to the DSE 7000 and add music drops and mix. My mix chain included an Aphex Compellor followed by an Aphex Studio Dominator. BANG! I remember calling my Hammerjacks guy and telling him that his studio rate just went up 50%. Naturally, he was shocked! Then I told him that because of the DSE 7000, he would not be spending a penny more than he had been spending because I could work so much faster. I also told him that he no longer needed to hang around while I recorded him over music drops to tape, so he'd only be here for maybe an hour instead of 3-4 hours. Naturally, he was delighted. I'm still working some with him today. The DSE 7000 continued to allow me to make a living until about 2000. By then it had become the Orban Audicy. There was a new controller (console) more tracks and more features. It was, however, being pushed into retirement by Pro Tools and other software. I sold mine to a nice guy whose name escapes me; Mike, I think. He was out of somewhere near the Great Lakes. Maybe he will read this and reach out. Sorry for the bad memory. He was doing VO work from his home and had used a DSE 7000. He didn't want anything else. Not even a Fostex Foundation 2000 that had come out in 1993. I saw it at NAB. It was good but it still wasn’t a DSE 7000. Mike met me in a mall parking lot in Harrisburg, PA and we did the transaction. Loading the tower and controller from my trunk to his felt a little like a dope deal going down. If there's a Hall Of Fame for radio production gear, the DSE 7000 deserves to be there.